Aleksandra is a large hand-made, ebonite, symmetrical fountain pen with gold and bakelite ornaments. When designing this particular make, we used the shape of a half-spindle, which is repeated in all three components of the pen. Two identical halves – the cap and the barrel – form a full shape of an oblate ellipsoid. The section is the third half whose surface appears stretched by the nib. Aleksandra’s ellipsoidal shape is accentuated by the bakelite ring whose various tones of red offer a contrast to the deep black of the ebonite. Beneath the ring, the pen is engraved with a unique serial number, divided by a 14-carat gold rod. Apart from its decorative function, this gold detail, protruding 1.5 millimetres above the pen’s surface, also has practical applications: it distinguishes the cap from the barrel and keeps the pen from rolling off slanted surfaces. 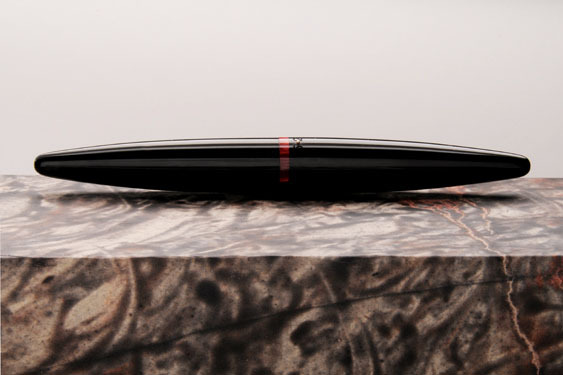 Aleksandra, like all other makes manufactured by WILAND, is a limited edition of just twenty-one pens. 14-carat gold nib. To every pen a certificate of authenticity is issued, which contains the details of the particular make, and serves as a life warranty for the pen’s first registered user. The pen is fitted with an ink converter. The case is made from wenge wood and is padded inside with perforated grey leather. The case is placed inside a cardboard box decorated with hand-painted paper and embossed with gold letters.